All transactions are safe and secure with a reliable history in online purchasing behind each of our associates. Buy the Boondock Saints Rosary Necklace and Celtic Cross to own Boondock Saints clothing and merchandise. If you are looking for a unique collectible or are trying to create a realistic Bookdock Saints costume, this hand-crafted Boondock Saints cross and rosary necklace is a good start. There are a variety of handmade options to choose from, with some offering better quality than others. Review the seller's descriptions and customer comments before buying. 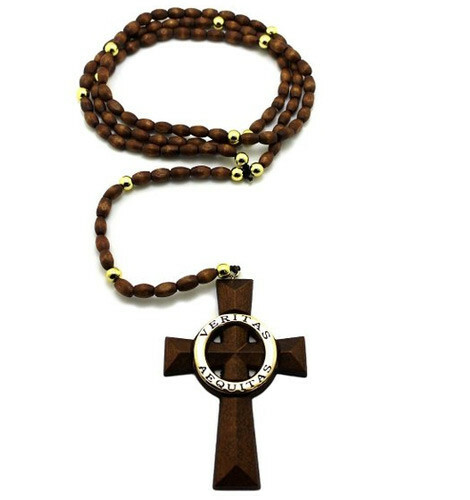 Pay attention to the wood quality of the Celtic Cross, the staining process and the quality of the beads in the necklace. It works great as part of a Boondock Saints Halloween Costume. In addition to the Boondock Saints Rosary Necklace and Celtic Cross above, browse the Boondock Saints Clothing Gallery for more apparel like men's and women's clothes, kids shirts or hoodies.